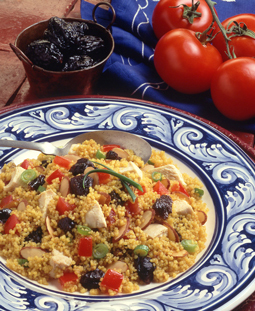 Moroccan Couscous Salad - A recipe from Savor California, the online showcase for extraordinary gourmet foods and beverages from California. In medium saucepan, combine chicken broth, dried plums and curry powder; bring to a boil. Remove from heat; stir in couscous and green onions. Let stand, covered, 5 minutes. Fluff with fork; allow to cool. Meanwhile, in small bowl, whisk together olive oil, vinegar, salt and pepper Add to couscous, tossing to coat. Stir in chicken and tomato. Just before serving, stir in almonds, if desired. Tip: To toast almonds, arrange in even layer on baking sheet. Bake in 350°F oven 5 to 7 minutes or until lightly browned.